Ronnie Wood has revealed that he got to hang out with Prince Harry and his new girlfriend Cressida Bonas at Glastonbury – but what did the royal say? Prince Harry is pretty serious about his new girlfriend Cressida Bonas, so much so that he’s been warning his celebrity friends from getting too close to the socialite. 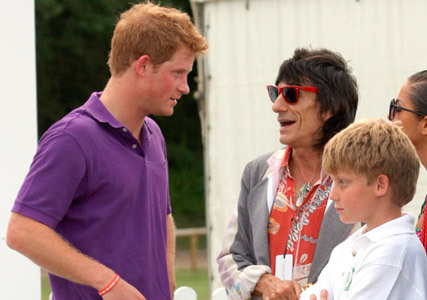 Ronnie Wood has revealed that Prince Harry jokingly told him to stay away from Cressida Bonas when the pair were hanging out at Glastonbury over the weekend. This is by far the greatest quote we’ve ever heard in relation to Prince Harry’s love life, or the royal family for that matter. While Prince Harry wasn’t photographed at the festival, it was reported that he stayed out partying until 4am with his girlfriend Cressida and their showbiz pals. Cressida was snapped wearing denim dungarees and a matching scrunchie while carrying a plate of chips back to her group. Onlookers spied Prince Harry and Cressida – with bodyguards in tow – watching the music at several of the festival’s different venues, before bagging a pass to cheer on the Rolling Stones from the side of the stage. It’s thought he spend much of the evening in the festival’s exclusive Shangri-La area – known as ‘naughty corner’ – which has room for just 30 people and serves absinthe. And it seems Glastonbury organiser Michael Eavis was responsible for Prince Harry‘s late-night shenanigans. 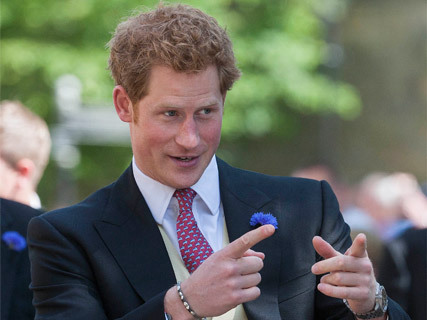 ‘Prince Harry was great actually,’ he told reporters. ‘I recommended that he should go on into the night, because the nightlife is what Glastonbury is all about.